Always follow NEC National Electric Code & use a licensed electrician. I highly recommend a WIFI smoke alarm and having a Class C rated(electrical) fire extinguisher nearby. How much power can you run on one circuit breaker / fuse on the main electrical panel that comes into the house? If it’s a 120 volt circuit it’s most likely 15 or 20 amps. If it’s a 208 / 240 volt circuit it’s most likely 15, 20 or 30 amps. But it can be just about anything. It just depends on what you are looking for and what outlets / receptacles you plan on using. The main thing to make sure is whatever you are using is rated for that much power. Whatever is the weak link in the chain of devices WILL catch fire if it’s not rated for that much current. For the circuit breakers I recommend using ones that are GFCI circuit breakers and arc fault circuit breakers. It this particular type isn’t installed now, and most likely they won’t be, they only take 5 – 10 minutes to install. You’ll be thankful if your rig ever melts down, short circuits or the dog ever sticks his nose on your open air rig! If not sure how to do this use an electrician. When buying breakers generally don’t go to home Depot or Lowe’s. Go to a good electrical supply house. Look for breakers that are made with Silver tungsten carbide contacts and not just plain copper. The copper ones fail and eventually arc over. PS Audio Power Port, Furutec & Hubbell Make Good outlets but are probably overkill for this application. 14-gauge wire is the smallest allowed for a 15 amp circuit. I recommend using 12-gauge; especially if you have a long run. For 20 amps 12 gauge is the minimum size allowed. I recommend 10 gauge; especially if you have a long run. The smaller the number on wire size the bigger the wire and more current it can handle. If your running a new breaker and wiring, I recommend going up to the next larger wire size then recommended. Everything will be much more efficient, the wires will run cooler, there will be much less voltage drop and it won’t cost that much extra to install. 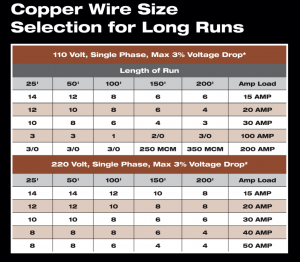 It’s ok to go to a larger wire size (smaller number) but not a smaller then recommended wire size. I also recommend wire rated for 90 degrees Celsius minimum. Higher voltages are more efficient then lower voltages and you can put much more power down the same size wire at higher voltages, saving a bit of money there in wire costs. If you run something at 120 volts pulling 15 amps at 240 volts it only pulls 7.5 amps. Look how many more rigs you can put on the same circuit now! Going to 240 just to be more efficient and save on power probably doesn’t make sense for most of us. You power saving will be a measly 1 – 2 percent. So say your rig is using 1,000 watts every hour (1 Kilo watt hour) for 24 hours at $.10 a kilo watt hour. That’s 24 kilo watts of power used a day. Coming out to about $2.40 a day or $72 a month. One percent of power savings is a saving of only $0.72 cents for the entire month. Now if you have a server farm, it starts to add up and you want to really spec your components with ones that are efficient. But for just a couple rigs, it really doesn’t matter. How many watts can a circuit handle? A 120 volt 15 amp circuit can handle 1,800 watts. A 120 volt 20 amp circuit can handle 2,400 watts. The NEC National Electric Code states that for a continues load (Our miners are a continuous load) we can only pull a max of 80% of the circuits rating. So for a 15 amp circuit that would be 1,440 watts max and for a 20 amp circuit that would be 1,920 watts. You get these by multiplying voltage (120) times amps (15) = watts (1,800) then multiplying that by 0.80% = 1,440 safe continues watts. Most of us our going to throw a miner in a spare bedroom, shed or garage. So we need to find out what lights or outlets are currently powered by that circuit. Turn on all the lights in the house. Plug a lamp into the outlet you want to put your miner on & make sure the lamp is on and working. Now turn all the breakers off in the main panel. Make sure all your sensitive appliances & computers are turned off before this. This next part helps if you have a second person. One by one turn on each circuit breaker, ask your partner if the light has turned back on. If not turn that breaker back off and do the next one. Once you’ve found the one that turns on the light, leave that breaker on. Now you need to go thru every single outlet in the house and see what ones have power. Label them or make a mental note. Find out how many watts each device is using that are plugged into those outlets. You can either read the label on the appliance or use a device called a Kill A Watt to find out. You just plug the lamp or whatever into the kill a watt and then plug the kill a watt into the outlet. It tells you watts, amps, volts, power factor, hertz, etc. After you’ve added up everything ( total watts normally running by lamps, tv’s, etc. ) connected to that one circuit; take those watts & subtract them from the max continues power that circuit can handle from whatever circuit breaker capacity you are using. For example the 120 volt 20 amp circuit breaker. Hope that wasn’t too confusing? Don’t forget about things you can’t see like attic fans, ceiling fans, whole house fans, outdoor motion lighting etc. If one of the plugs has a motor on it or HID lighting, you may want to find a different circuit to put your mining rig on. 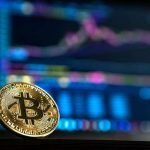 Any times those type of devices turn on they use a HUGE amount of initial current and will probably reset, pop or blow the circuit breaker and turn off your mining rig. Our mining rigs draw so much current it’s probably not feasible or worth it to pay for backup power. But I will mention it because a few of us are using our gaming PC or home computer to mine and we want to protect it from power surges, brownouts and blackouts. What to look for in a backup power supply? The main thing is how long it takes to switch to backup & the kind of “wave” it generates. Most are all pretty good now-days. But one issue I have been seeing come up more and more. The APC consumer grade cheap ones use a stepped sine wave. On a lot of the newer digital computer power supplies the APC UPS power backups won’t power up your computer. You have to get a true since wave backup power supply. Just something to keep in mind. This cyber-power one doesn’t have that issue, but when the batteries die on these, they completely stop working. So be sure to keep an eye on them when the battery starts to fail or lose capacity. I would probably use a backup power supply on your modem, router & switches; since these are a bit more sensitive & they don’t use too much power. Here’s an APC one that is Pure Sine Wave, but it’s pricey.. If your running multiple rigs on one circuit make sure you use a high quality extension cord or power strip. Those $5.00 ones at home depot will not cut it. Your going to start a fire or burn up your rig. 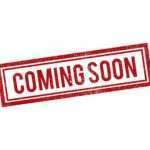 It’s also worth checking the specs of all equipment you are running of what environmental factors it can handle. Max & minimum temperatures & max and minimum humidity. We’ll talk about cooling, ventilation, air conditioning, swamp coolers, etc. in another article. Wow, all this and we still haven’t’ actually got to choosing a power supply! We have roughly two main choices for a for supply. Either a server type PSU or more of a home or gaming computer type power supply unit (PSU). If you’ve ever open up your home computer that’s the type you’d see. The server type power supply units are typically much louder, But A LOT cheaper. If your mining bitcoin or using one of their ASIC miners, It’s going to be loud anyways, so just get a server type power supply. Here’s one on Amazon from Bitmain; it will put out 1,200 watts at 120 volts or 1,600 at 220 volts. It has ten – 6 pin PCIe Connectors. Power cord not included, requires standard PC power cable (C13). If you have an old computer laying around the cord form that would usually work. Just make sure to check the amp rating on it & the length to make sure it has enough capacity for the device you are running. 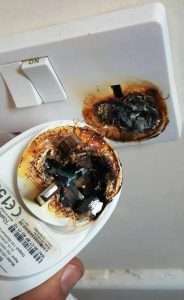 Some cords are super cheap and will cause a fire if used at the full 1,200 or 1,600 watts. If your going 220 volts their will be a lot more options for power cords, ask away in the comments for your specific application. If your mining one of the other alt coins, you can still use the bitmain power supply but it will be much noisier and you might not get wifey approval. So yea in the house, get a computer power supply. Don’t go super cheap. You want something high quality that does a good job of regulating power & isn’t going to fry one of your $1,000 GPU’s. Even some of the major name brands of made a few “duds” so read the reviews. Check how much noise it puts out and make sure your ok with that. SO even come with no fans. How many watts do you need to run everything. motherboard, CPU,CPU fans, GPU’s, case fans, Hard drives, fancy LED’s. etc. How many graphics cards do you plan on running on one system. 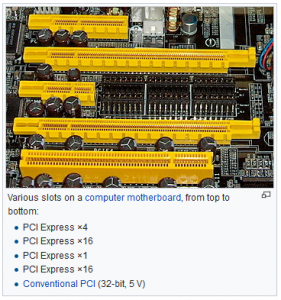 So motherboards can handle 20 graphics cards now. GPU-Z can tell you power usage. It’s an estimate, not an exact measurement, but it should be in the right neighborhood. You can also go on the manufacturer website. 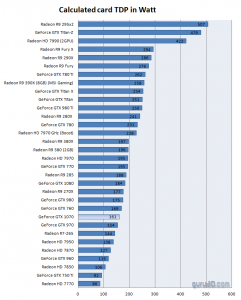 Plan on at least 100 watts per GPU, but some go much higher. 300+ watts. You can lower power consumption of the GPU’s with overclocking utilities. You can daisy chain multiple power supplies together so you don’t have to buy a high wattage power supply. It can cut your costs by 50%. Use the Kill-A-watt meter mentioned above for exact wattage numbers. How many power connectors will you need? Some graphic cards take 4 power connectors, plus if your running USB risers, they will need a connector as well. If a power supply is 1,200 watts. but your mining system only need 200 watts, that’s all it uses. So it’s OK to oversize the power supply, so you can add on to the system later. What connectors does the USB riser use & graphics card. 6-pin PCIe, 6+2 pin PCIe or simply 8 pin. The 6 pin have a max power of 75 watts & the 8 pin 150 watts per connector. Here’s a link to typical wattage’s & total connections needed on a GPU. 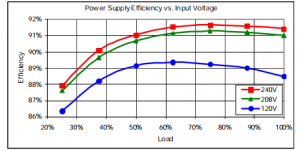 Power supplies run coolest & most efficient at between 65% and 85% of the load. If you are near max load it’s going to use more power and also run the fan all the time. So with an 850 watt power supply, at 65% load that would be 453 watts & at 85% load that would be 723 watts. 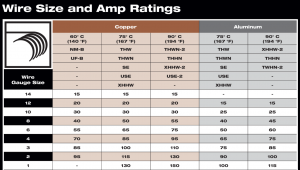 Reed the power supply efficiency rating. If it’s 80% efficient, 20% of the power gets lost as heat. So for an 850 watt power supply that’s 80% efficient, and you are using 850 watts, 170 of those watts would be lost as wasted energy. 170 watts an hour multiplied by 24 hours is 4.08 kilowatt hours a day, 122.4 kilowatt hours a month & 1,489.2 kilowatt hours a year. AT $0.12 cents a kilowatt hour you would waste $0.49 cents a day, $14.69 a month or $178.70 a year. The number add up and so do our lost profits. A standard height x16 add-in card intended for server I/O applications must limit its power dissipation to 25 W. A standard height x16 add-in card intended for graphics applications must, at initial power-up, not exceed 25 W of power dissipation, until configured as a high power device, at which time it must not exceed 75 W of power dissipation. 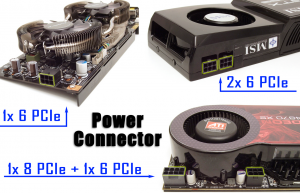 A full-sized ×16 graphics card may draw up to 5.5 A at +12V (66 W) and 75 W combined after initialization and software configuration as a “high power device”.Optional connectors add 75 W (6-pin) or 150 W (8-pin) of +12 V power for up to 300 W total (2×75 W + 1×150 W). There are cards that use two 8-pin connectors, but this has not been standardized yet as of 2018, therefore such cards must not carry the official PCI Express logo. This configuration allows 375 W total (1×75 W + 2×150 W) and will likely be standardized by PCI-SIG with the PCI Express 4.0 standard. The 8-pin PCI Express connector could be confused with the EPS12V connector, which is mainly used for powering SMP and multi-core systems. 80 Plus certification – I recommend you get a power supply with this certification. Their are several tiers. Each higher tier is a bit better; including 80 Plus Bronze, Silver, Gold, Platinum, and Titanium certifications. I’d get at least bronze. Do the math. he wasted electricity starts adding up if you have a large mining farm. So what do the different 80 Plus ratings mean? The basic 80 Plus rating means that the PSU is rated for at least 80% efficiency at 20% load, 50% load, and 100% load. The 80 Plus Bronze rating means that the PSU is rated for at least 82% efficiency at 20% load, 85% at 50% load, and 82% at 100% load. The 80 Plus Silver rating means that the PSU is rated for at least 85% efficiency at 20% load, 88% at 50% load, and 85% at 100% load. The 80 Plus Gold rating meas that the PSU is rated for at least 87% efficiency at 20% load, 90% at 50% load, and 87% at 100% load. The 80 Plus Platinum(bet you didn’t know there was a Platinum) rating means that the PSU is rated for at least 90% efficiency at 20% load, 92% at 50% load, and 89% at 100% load. 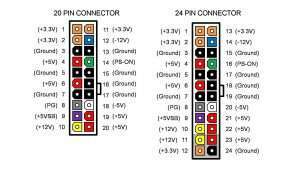 What type of power supply do you need that interfaces to motherboard? For example AT or ATX connection. Most board now days use ATX. The connector itself is a Molex 39-01-2240 connector, often called a Molex Mini-fit Jr.
Power supply’s are categorized in tiers. Tier 1, 2, etc. Stay in Tier 1 or Tier 2. Tier 3 or less is something you should avoid if possible. Another aspect of PSUs that often gets overlooked is modularity. Direct Cable: All PSU cables come from the PSU housing directly. This setting is cheaper in production or design, making PSUs cheaper to consumers. However, this is not good for the enthusiast who may need to change his build from time to time. Cable management is also much harder with a mess of spaghetti cables to deal with. Semi-Modular: All necessary cables come from the PSU case directly such as ATX Power (20+4) connector, CPU (4+4) connector, and PCI-e (6+2) connector. Other non-essential plugs such as Molex (4-pin) and SATA (15-pin) connectors, are modular allowing you to remove them at will. Semi-modular offers middle ground pricing and is a decent cable management solution. Full-Modular: All cables are removable, making installation extremely easy and sleek. Cable management is extraordinarily easier with a full-modular PSU and it makes it easy if you change builds frequently or even if this is your first build. 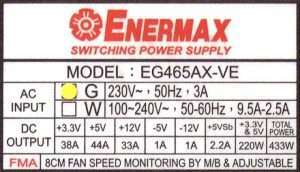 ALWAYS read the power outputs on the power supply label. Her’s a good example where a high wattage power supply can’t actually supply enough power to run a graphics card. So here’s it’s showing we have 433 watt power supply with 33 amps of DC output on the 12 volt rail. 396 watts for 12 volts. The GeForce 8800 ULTRA SLI (768 MB) runs at 354 watts at 29 amps. It’s using almost all the available power supply power with nothing left over for other components. It’s also dangerously close to the max amount of power the 12 volt rail can support. A fire waiting to happen. Single vs multi rail power supply’s – Their is a lot of debate about what’s better. One all the power goes on one “rail” on the power supply. If one thing gets fried, everything goes and shuts down. With a multi rail, say one GPU fries, the power supply can shut that one rail down and possibly prevent a fire or further system damage. But your current limited for that one rail and all the others. So it’s good and bad. You really have to think when your designing your mining rig. Making sure your not usign to much power on a rail. With a single rail, you jsut plug it all in and your good. With multi rail a lot of the newer power supply’s allow you to view power use on each wire real time. Sorta coo. Warranty: Most of the better PSU’s come with a 5 – 10 year warranty. If your running at 200 volt plus your most likely going to need some kind of power distribution system or power distribution unit PDU, that way your electrician can just run one high amp outlet. Tripp Lite makes some great products. Here’s a 20 amp and 30 amp option. The first one is a horizontal PDU that uses a NEMA L6-20P plug and needs a 20 amp circuit with an L6-20P receptacle. The second one is a vertical PDU that uses a NEMA L6-30P plug (similar but not identical) and needs a 30 amp circuit with a L6-30P receptacle.